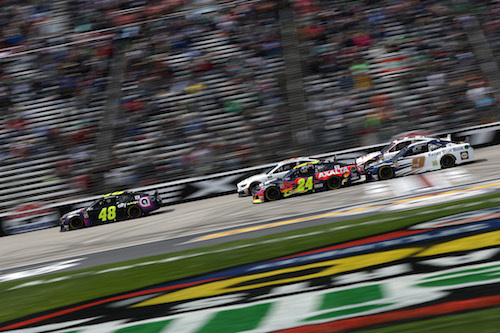 during the Monster Energy NASCAR Cup Series O’Reilly Auto Parts 500 at Texas Motor Speedway on March 31, 2019 in Fort Worth, Texas. NASCAR may return to single-car qualifying for the Monster Energy NASCAR Cup Series at tracks where drafting may come into play during qualifying. The 2019 Cup Series aerodynamic rules package, which includes variations of a larger front splitter, larger rear spoiler, aero ducts and a tapered spacer, has resulted in drafting during qualifying at tracks 1.5 and larger. The drafting has resulted in a waiting game among teams/drivers, as nobody wants to go out on the race track first, putting themselves at a disadvantage over cars/drivers going out behind them and drafting with them. The waiting game resulted in none of the 12 drivers advancing to the final round of the three-round qualifying session at Auto Club Speedway in Fontana, Calif., for last month’s Auto Club 400. NASCAR instituted new rules prior to last weekend’s qualifying at Texas Motor Speedway for the O’Reilly Auto Parts 500, stating that any car not making a qualifying lap during any round to which it advanced would have its previous round lap(s) disallowed and, therefore, start the corresponding race in the back. The sanctioning body also stated that drivers/cars that blocked another driver’s attempt to go out onto the track to make a lap also would start the corresponding race in the back. All drivers managed to make qualifying laps during rounds in which they were supposed to at Texas, with the exception of Alex Bowman, who wrecked in the first round of qualifying after making a lap fast enough to qualify for the second round. But Clint Bowyer was adamant that Ryan Newman blocked him from getting off pit road to make a qualifying attempt at one point in the opening round. Newman was not penalized for blocking in qualifying. Instead, he was penalized later in the weekend for his car twice failing pre-race inspection. A change in qualifying may not be announced by NASCAR for a couple of weeks, as the Cup Series races at the short tracks of Bristol (Tenn.) Motor Speedway and Richmond (Va.) Raceway the next two weekends. The draft does not come into play at those tracks.